The word “Percent” comes from the Latin word “per centum” and the Latin word “centum” means 100. Percentage actually means “out of 100″ and it is represented by the symbol (%). The symbol can be efficiently used to represent a fraction that has a common denominator of 100. For instance if there are 29 girls in a class which has a strength of 100, then you need not represent it as 29 out of 100 students are girls as you can represent it in terms of percent and say 29% of the students in the class are girls. The box on the left has 75 of the 100 squares blue, so 75/100, or 0.75 of the box is green. In other words, to convert decimal into percent, shift the decimal point two places to the right of the number and add a ‘%’ sign. 1/4, 25% and 0.25 mean the same. In order to convert 0.25 in percentage, first multiply the decimal by 100 and then put a ‘%’ sign beside the number. This is how any decimal number is converted into percentage. 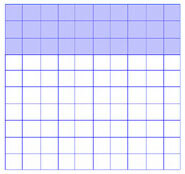 In order to convert a fraction into percentage, first the fraction is converted into a decimal, then into percentage. 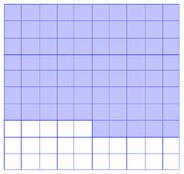 In the figure above, 30 of the 100 squares are blue. It means 30 per 100 or 30/100. If number 30 is divided by 100, we get 0.3 which is a decimal number. In order to convert percentage to decimal, just divide by 100 and also remove the ‘%’ sign. In other words, to convert percent into decimals, shift the decimal point two places to the left. Moreover, percent always means per 100 and therefore it always has 100 as the divisor as 35% actually means 35/100. In that way, when you say 100% it is actually 100/100 i.e, 1. In fact, 100% of any number is exactly that number. Similarly, 200% means twice the number. The cost of a T-shirt is $60 in a showroom. However, to clear old stocks, the showroom suddenly announces a discount rate of 20%. Then what will be the cost of the T-shirt? John got 80 in Mathematics in his last exam. This time John practiced Mathematics even harder and his marks increase by 5% compared to last time. What was John’s marks this time? 5% of 80 = 5/100 x 80 = 4. Therefore, 5% of 80 is 4. After a 5% increase in the number, this time John got 80 + 4 = 84. 4 out of 5 people sleep on their right. Find out the percentage of this. Therefore, 80 % people sleep on their right. The railway board constructed a pillar 130 m long to stand a bridge but later on it was realized that it needed to be longer. The engineers studied the pillar and suggested a further 10% increase in its size. What would be the size after the pillar is reconstructed? The size of the pillar will be 143m. 10% of 130m = 10/100 x 130m = 13m. Therefore, 10% of 130m is 13m. The profit of a company during the first quarter was $14,000. However, in the second quarter there was 4% decrease in the profit margin. What was the profit in the 2nd quarter? After the reduction in the profit, the profit in the 2nd quarter was $13440. In an election, 2,268 people voted for George, 8,820 voted for Anna and 1,512 voted for Stuart. What is the percentage of votes that each of the candidate received? The total number of votes is 12,600. Therefore, George, Anna and Stuart have received 18%, 70% and 12% votes respectively. Find out how much interest will $2000 earn in 1year at an annual interest rate of 8%. What is the discount amount if a car costing $9000 is discounted at 9%? If 23 % of a number is 46, find the number? In an examination, Betty secured 372 marks. If she secured 62% marks, find the maximum marks. Let the maximum marks be ‘a’. Hence, the maximum marks is 600. In an election, a candidate got 60% of the total valid votes. 15% of the total votes were declared invalid. If the total number of votes is 500,000, find the number of valid votes polled in favor of the candidate. Thus, the number of valid votes polled in favor of the candidate is 255000.